If your hair feels dry and frizzy, skip the bottled conditioner -- you can make your own soothing remedy with foods from your kitchen. Olive oil and avocados help moisturize your hair and restore its lustrous shine. When your mane needs deep conditioning, whip oil and avocado together with other natural ingredients to make a hydrating hair mask. Both olive oil and avocado have moisturizing properties, so they'll leave hair feeling soft and looking shiny. 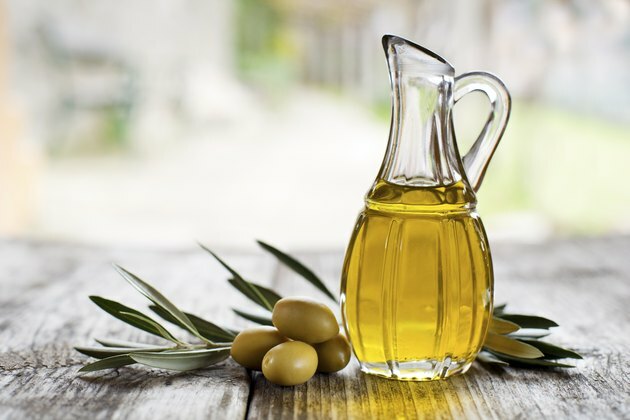 Olive oil soothes frizz, treats damage and helps get rid of tangles. Avocados contain biotin, a vitamin that may make hair and nails stronger. Warm 1/2 cup of olive oil in the microwave for about 30 seconds. Massage the oil into your hair from the roots to the ends. Apply more oil to the ends if they're very dry. Cover your hair with a shower cap or towel, then let the oil set for 30 to 45 minutes. Shampoo as usual; rinse well. To make a moisturizing mask, mash an avocado into paste, then mix it with 1/4 cup of steel-cut or rolled oats. Combine the paste with 1/8 to 1/4 cup of olive oil, depending on your hair's dryness. Add 1 cup of milk and stir well. Smooth the mixture over your hair; wait for 30 minutes and rinse. To make a detangling conditioner, put 1/4 cup of olive oil, 1/2 cup of shea butter, 2 tablespoons of apple-cider vinegar and one sliced avocado in a blender. Blend until smooth, apply to hair and wait for 30 minutes. Rinse well for soft, shiny locks.